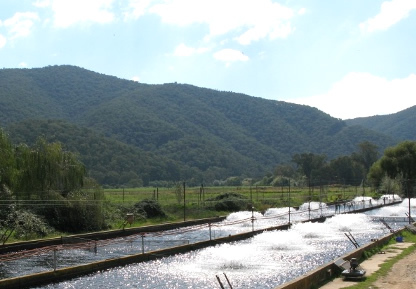 The Snowy Mountains Trout Farm is the largest in New South Wales. It’s a family owned and run business nestled beneath the Blowering Dam wall in the foothills of the pristine snowy mountains catchment at Tumut. The farm has been owned by Rod Smith and his family for over 20 years, and Rod himself has more than 30 years experience growing and smoking trout. The Tumut River provides the farm with the cool clear pristine water required to grow premium quality rainbow trout. Snowy Mountains Trout produce a range of fresh, frozen, hot smoked and live fish for supply to markets around Australia. The farm is regulated under a range of NSW Government permits including from DPI Fisheries and the EPA.